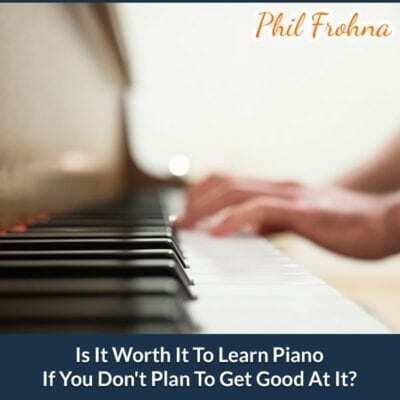 Is It Worth It To Learn Piano If You Don’t Plan To Get Good At It? Did you know that learning to play keyboard instruments can be a very effective form of self-improvement?! Playing the piano is the most complicated activity done with the hands that humanity has come up with. Compare this to the surgeon’s work – widely regarded as extremely complicated. It requires great precision, so-called of a hand, experience and, of course, 100% knowledge of medicine. However, in terms of manual it is far from playing keyboard instruments. And now the best! What do you think of this fact in practice? Well, that learning to play keyboard instruments is one of the best ways to improve your mind! You will ask: but what exactly can I get out of it? Oh please! Below is a list of benefits. The degree of complexity of playing the piano makes the mind – to overcome it – must work at its highest level. The consequence of this is, of course, the rapid increase in its efficiency. Another benefit of learning to play is to improve your attention. At an advanced level, playing the piano is like meditation! You certainly noticed that a professional pianist at the concert plays as if in a trance. His concentration and focus on one activity are close to ideal – he becomes one with music and the instrument. Is this effect not similar to those that are achieved by practicing yoga, Zen or other systems that use meditation? The spectacular result of this level of advancement in mastering the instrument is to play an hour of the concert that lasts without a single mistake. Think – thousands of notes and not a single mistake! Of course, as in any other field of self-improvement, this level is achieved by only a few. But let there be a fact in your consciousness that there are such people, and so it is possible. Now let’s get down to the ground a little. Do not think about it that you may not be able to achieve such skills in the game. Time and energy devoted to learning will certainly not be wasted. The work you do will enrich your personality, improve your mind, organize your psyche and improve your hands. It is worth noting that playing the piano requires a high level of movement coordination. Every hand and every finger have their tasks to do and – most importantly – they have to do it precisely with each other in cooperation. If you have not yet tried, believe me, that it is difficult at the beginning. Another effect of undertaking (and continuing!) Learning to play keyboard instruments is to increase the level of regularity at work. And yet this is a very important feature, without it you will learn nothing but sitting in a chair and watching TV. An additional benefit of learning to play the piano is memory exercise. When learning a song, we use notes with the help of the composer. However, along with the progress of science, the phenomenon of “disturbing” notes appears. It turns out that looking at the notes, you can not play the song smoothly and at the right pace. Moving your sight from the keyboard to the notes prevents you from playing smoothly and confidently. What is the answer? Of course, learn a few or a dozen or so thousand notes by heart. You’ll admit it’s a really good way to improve your memory. Another positive effect of the provision on learning the game is the formation of a strong will – of course, provided that this provision is consistently implemented. Finally, the additional benefit of systematic piano practice is improving physical condition. Contrary to appearances, playing an instrument really requires it. Well, what will you say? Is it worth to learn to play?!? And one more thing. You can start learning at any age. Admittedly, if you start as an adult, you will not be a virtuoso. Of course, the child will benefit the most from learning, whose mind is in the phase of intensive development. Even if in the future they would give up playing, the benefits achieved during learning will not disappear! So we strongly encourage you to start learning to play the piano. Its effect will be a better quality of your life based on the benefits described in this article.